February 28: 7:30 a.m. to 6:30 p.m.
March 1: 7:30 a.m. to 10:30 a.m. The survey will take approximately one hour with paperwork for parents to fill out. Parents are asked to park in the North Parking Lot during the survey. 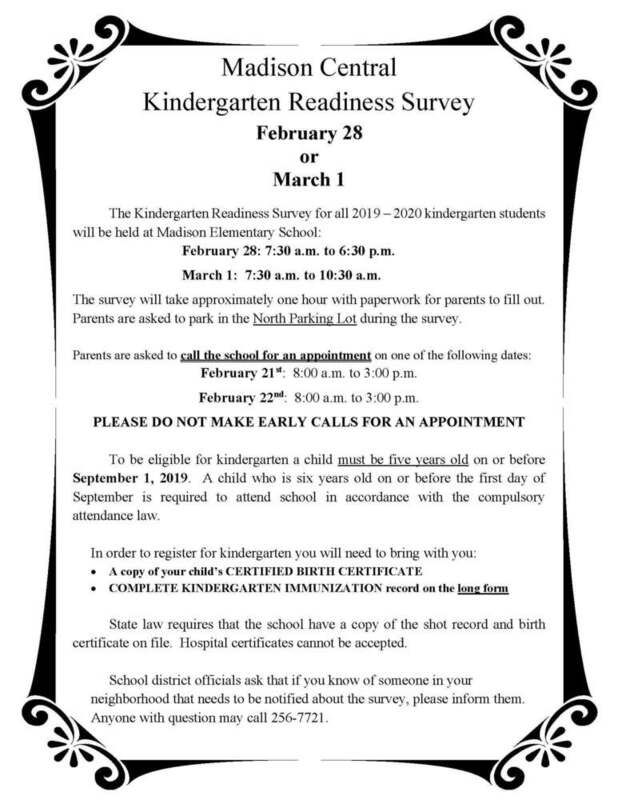 February 21st: 8:00 a.m. to 3:00 p.m.
February 22nd: 8:00 a.m. to 3:00 p.m.
To be eligible for kindergarten a child must be five years old on or before September 1, 2019. A child who is six years old on or before the first day of September is required to attend school in accordance with the compulsory attendance law. State law requires that the school have a copy of the shot record and birth certificate on file. Hospital certificates cannot be accepted. School district officials ask that if you know of someone in your neighborhood that needs to be notified about the survey, please inform them. Anyone with question may call 256-7721.